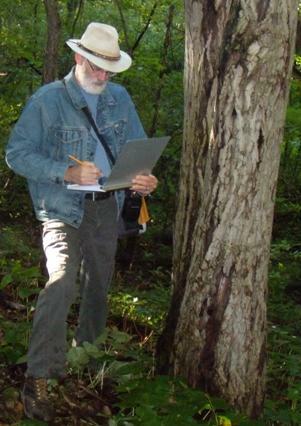 The following documents were written by John Irwin, previously a Forester and Stewardship Coordinator with the Ontario Ministry of Natural Resources and now retired. John, with tongue firmly planted in cheek, sometimes refers to them as “the (forestry ) gospel according to John”. Many were written to support workshops, information sessions, as part of various committees, or simply as information sources for landowners. They are more technical than some government documents, particularly the silvicultural key and the logging damage study, but the others are fairly straightforward. Besides including some fairly scientific concepts, they also focus on some everyday rules that, with a few simple measurements or observations, help field foresters come up with quick answers in the field. For those who like to delve deeper, a comprehensive list of references is included. They are listed here to provide general forestry information for woodlot owners or others interested in learning more about forestry. Disclaimer: If you choose to use any of the following information you do so at your own risk. Neither the author nor the publishers of this web site assume any liability for your use of the content. 8 Ways – Planting Survival – How to increase the survival of your planted trees, by better shipping, handling, storing, and planting the trees. 2000 Fire Presentation – This is the outline of a presentation on prescribed fire and its uses, presented to a prescribed fire workshop in Brant County, in 2000. Basic Forestry – An outline of forestry principles, aimed at the student Envirothon program. Includes explanations of management planning, forest sampling, how and why forest measurements are taken, and dispels some common myths. Best Shrubs for Wildlife – Describes some of the most useful native shrubs that are commonly planted to improve wildlife habitat. Forest Inventory – Describes a method that landowners can use to create a picture of their woodlot’s stand structure and stocking, and potential harvest. Forests and Soils – Written for Envirothon students to help them develop a basic understanding of forest soils and the relationship between soils and forest productivity. Glossary – A summary of forest terminology, what they mean and how they are used, including some handy rules of thumb used by foresters to give quick volume information on forest stands. Growing Nut Trees (Butternut) – Prepared for the butternut recovery program, a guide to collecting, handling, storing, stratifying and planting butternut nuts. How Sap Flows – Describes how maple sap flows when it is collected for maple syrup. Key to Silvicultural Prescriptions – A decision key that leads from such stand characteristics as species composition, shade tolerance, stand age and stocking, to a recommended approach to silvicultural treatment. This includes a glossary, a list of tree species shade tolerance, and references. Logging Damage – Results of a study carried out in the Parry Sound District in 1972, that looked at damage to residual trees during selection and uniform shelterwood harvesting. Planning for Tree Planting – Some ideas about how to plan a reforestation project including looking at site, soils, species selection and planting arrangement. Planning Forest Operations – Includes a quick inventory methodology, and looks at planning plantation thinning, and hardwood harvesting. Includes some of the “Forest Inventory” and “Plantation Management” articles. Plantation Management – Looks at how to clean, prune and carry out a thinning in a plantation. References – A list of reference material on which many of these documents are based. Similar to the one in the Silvicultural Key document. Seed Stratification – How to germinate common tree and shrub seed, in order to grow your own nursery stock. Selling Timber – Things you should know when selling your timber, including hiring a consultant, a sample sales contract, tree and log volume tables, tree maturity, a glossary and how to consider some wildlife values. Thinning Walnut Plantations– How to plan a walnut plantation thinning. Tree Identification – Originally designed for tree bylaw officers, this contains ways to identify common trees including some short cuts, and also wood characteristics, which would help identify the species from a cut stump. Tree Nurseries – Originally done for butternut, this lists some local providers of native tree, shrub and plant species. Trees and Drought – Written for a maple syrup meeting in a time of tree stress caused by drought. Trees and Forest Decline – Discusses many stresses and how they act on trees and cause tree decline. This includes environmental stresses as well as natural and pathological stresses. Vegetation for Erosion Control – A list of common plant and shrub species useful for ground covers and erosion control. Watershed Silviculture – Written as a silvicultural section in the Grand River Conservation Authority Watershed Forest Plan. Discusses how silviculture and forestry fit into the overall forest strategy of a watershed. Woodlot Economics – Suggests possible revenue potential of woodlots based on growth projections and typical wood values. Woodlot Ownership – An introduction to how hardwood trees and stands are managed silviculturally, their volume production potential, and silvicultural options for management. Woodlots and Development – Provides a methodology for suggesting, from a forestry point of view, what woodlots could be a priority for preservation from development. Complementary and useful to a designation of “Significant Woodlands” under the Planning Act.